The guru on circus curses is undoubtedly Dr Florent Heintz who wrote his thesis at Harvard on "Agonistic Magic in the Late Antique Circus". He is now an expert on Egyptian antiquities at Sotheby's in New York. Several years ago when he was associated with the Worcester Museum (that off-the-beaten track Mecca for Antiochophiles) he wrote the article "Magic Tablets and the Games at Antioch" (page 163) in Christine Kondoleon's excellent catalogue for the exhibition Antioch: the Lost Ancient City. Interestingly he starts off his thesis by invoking the chariot race scene from the film Ben Hur in which some of the drivers are seen acting out magic rituals to try and gain themselves an advantage in the race. 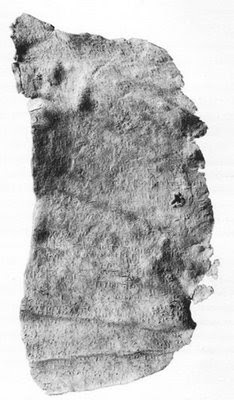 Below can be seen one of the circus curse tablets found ,by the Princeton team in the 1930s, rolled up in a drain along the central barrier and turning post of the Antioch hippodrome. This is currently to be found at the Princeton University Art Museum (inv. 3603-I57). This was made of a thin piece of lead which was rolled up and secreted in a location where it could do most "harm" or "good" depending on one's point of view. This example dates from the late fifth or early sixth century AD. "Curse tablets and binding spells were quite popular in ancient Antioch, especially at the chariot races. To impress their emperor, charioteers would try to make their rivals' chariots overturn directly opposite the imperial box, and a curse tablet was one of the methods for accomplishing this. This curse tablet opens with a long invocation of divine epithets and magical names; it is addressed to Hecate and other deities of the Underworld. Then the curse itself: "Bind, lay waste, and overturn the horses of the Blue [faction]." This is followed by 36 Greek names of horses. Usually curses aimed at circus competitors target the charioteers as well as the horses; this is an exception to the rule. By the end of the fourth century, chariot racing had been transformed from a contest of horses and drivers to one of magicians. All this was a risky business, as magic was against Roman law and severely punished. The Blue and Green factions, mentioned in this curse, were imperially sponsored organizations that took over the staging of public entertainment in the East in the fifth century AD; less curse tablets were found after this time than before". The Patriarch of Antioch, Euphrasius, had a varied end. Normally we do not deal with the Christian history of the city as it paralleled (and maybe partly caused) the city's decline. However in looking at the obscure subject of the obelisk in the circus the name of the patriarch appears. The versions are various. All have one thing in common in that he died during the massive earthquake of 526 AD. We initially heard that he was crushed while conducting a service at the Golden Octagon when some part of the structure fell upon him. More recently we see it related in Humphrey's Roman Circuses that he was killed and buried by the falling obelisk that stood on the central barrier running along the circus. Presumably he had taken shelter there (like Trajan in 115 AD) when the earthquake hit. Then we stumbled on The Chronicle of Pseudo-Dionysius (or the Zuqnin Chronicle) as edited by Witold Witakowski. This book is a Syriac historiographical work dating from the end of the eighth century. The work is written from the point of view of a religious dissident, (he was a Monophysite) whose personal experience as a persecuted monk in his native Mesopotamia, as well as his later life in Constantinople, make the chronicle an interesting and offbeat source. In his version the rescuers found the body of Euphrasius "... was found in a cauldron of pitch used by wineskin makers, who worked beneath his episcopal residence. When the residence collapsed and fell, he happened to fall into the cauldron. The whole of his body sank down in it and he was cooked in the pitch. His head was found (hanging, as if he had) fainted, outside the rim of the cauldron. Thus he was recognised from his face while his bones were found stripped of their flesh in the pitch". We have to chuckle as this end would have suited a martyr but for a bishop going about his daily business it was scarcely one of the usual hazards of the job. However the author notes "for the believers however it was a wonderful thing for they remembered the impudence of his evil deeds, his cruel plans, persecution and pillage which he had done". Being a fitting end, in the author's opinion, might imply some embellishment, including moving the place of death and the means! It is hard to figure out why the Patriarchal Palace should also have doubled as a wineskin factory. Boiling pitch would have made the place insufferably odorous. pseudo-Zacharias and Malalas have him thrown by the convulsion into a vat of boiling wax (a sticky end indeed) while the Chalcedonian writer Marcellinus comes has him crushed by an obelisk in the hippodrome (this being the source for Humphrey). No further information is forthcoming on this obelisk. A number of circuses did have them on the central barrier. The Circus Maximus had several which have now migrated to other parts of Rome. The genuine article of course came from Egypt, so we are left to wonder whether Antioch's obelisk was an Egyptian import and what happened to it after it had fallen. Was it irretrievably smashed or was it moved somewhere else in the city when the Island was abandoned and the hippodrome was cannibalised for building materials for the expanded city walls? As it was probably of granite, if it was like the other obelisks from Egypt, it would not have been fodder for the limeburners who did so much damage to the marble and limestone of the city as parts were abandoned. It may still await discovery, though it is most certainly not still to be found at the hippodrome. Antioch was on of the great cities of the Jewish diaspora even before the diaspora happened. The Jewish community rapidly coalesced around the new empire in which they found themselves in the wake of Alexander's death and the carve-up of his former "domains" amongst his generals. Antioch was the capital of the Seleucid kingdom and this covered Judea. Antioch was an epicentre of politics and commerce and the community started to grow with the city. Carl Kraeling's article "The Jewish Community in Antioch" in the Journal of Biblical Literature (Vol 51, no.2 June 1932 pp 130-160). Then there are the sources on the Ashmunit synagogue/shrine that I cite in my comments on that issue. Firstly I would like to give the opinion that the Jewish community did not have a "ghetto" in Antioch. As is well-known that whole concept of ghettoization did not develop until the Middle Ages (or later) in Venice. Theoretically the Jews of Antioch were free to live wherever they liked in the city (at least we have never heard of any restrictions). Moreover it should be remembered that Antioch was one of the very centres of hellenizing corruption that spurred the Maccabean Revolt. What was "hellenization" if not assimilation? Ancient Antioch should be looked at as somewhat akin to Berlin in the 1920s: a whole gamut of different degrees of Jewishness and assimilation. Thus the most "orthodox" would have been gathered closest to the synagogues and other community facilities required to maintain the lifestyle of a religious community with strict dietary and other behavioural laws, while the most assimilated would have positioned themselves wherever their lifestyle and social status (or business or political activity) deemed most convenient for them to be. Thus some of the lavish villas of the mountain slope, the Island or Daphne may have belonged to well-off assimilated families. There is also evidence for agricultural Jewish communities, some devoted to the cultivation of rice on the Plain of Antioch. We might also note the historical oddity that as Christianity grew in the city, there were criticisms thrown against some of the Christians, by their leaders, that they were overly fond of attending Jewish festivals (as the pagan element also seemed to enjoy doing). If Antioch was anything it was a party town and the newly converted Christians clearly didn't want to miss out on a festival no matter who was holding it! This is not a sign of a walled-off isolated community. However, the subject of this note is the identifiable districts. With an estimated Jewish population of 60,000 at its peak (according to Kraeling) the Jewish community must have been congregated in part but certainly with other members living all over the city. The area that is most clearly associated with the community is the Kerateion which was either just inside, or just outside, the Cherubim Gate. Now 60,000 people was 10-15% of the total population of the city. Thus we are not talking here of a block or two but of a very large group of people that grouped together would occupy a large territory. There is no indication that the Jewish community was any more, or less, crowded than the rest of the populace. Thus a whole swathe of the southern part of the city may have constituted the Jewish quarter, both within and without the walls. In our comments on the destruction by Chosroes it was noted that the quarter was the one area spared destruction in the fire that his troops started. Was this because it was outside the wall? I have to think that the name Kerateion harks back to the very founding of the city when various Greek groups were settled in the city and their districts were named after their homelands. Thus it would seem that the district was most likely inside the Cherubim Gate (which is where Wilber's map put it) rather than an unwalled suburb (until the Theodosian Wall enveloped it). The second Jewish area that is mentioned (and this also dates back to the Seleucid period) is the community at Daphne. I shall not go into the history of this but most of the authors date this group back a very long way. How densely populated was Daphne? It can't really have been very dense if it was to maintain its Arcadian splendour. Thus its population (pagan, Jewish or otherwise) may never have been more than a few thousand in total, with villas and upscale residences predominating. I might remind that the "theatre" (or was it the theatron) at Daphne was supposedly built on the site of the synagogue. There clearly was a community there but did it make up more than a few hundred or few thousand out of the larger number in the vicinityof Antioch? "Marcus Agrippa, it will be recalled, improved a section along Silpius east of the town, and Marcus was known as a friend of Herod the Great and a friend of the Jews. There is nothing improbable in the supposition that Herod's building operations, and those of Agrippa, had some relation one to the other, and that both, affecting as they then did the Eastern suburbs of the Seleucid city had some immediate relation to a people or a cause in which both donors were interested. We therefore submit the hypothesis that the object of the joint enterprise was that of improving and connecting with the city a Jewish settlement of the XXXX or "plain" of Antioch. This will not preclude the existence or subsequent establishment of other similar colonies still farther out in the plain, but it will explain the tradition that the churches and sites connected with the early Christian apostles all lie in the extreme eastern part of the Justinian city, and that the Plethrion, built under Didius Julianus in the eastern portion of the Tiberian development, was constructed on the site of a house owned and inhabited by a Jew Asabinus". Thus Kraeling associates the Vicus Agrippae with a secondary Jewish district, gives a rationale for Herod's street-building in that direction and also explains why the initial concentration of the Christian community was concentrated at the far north-east of the walled city. Something here to ponder which might eventually be helped by some more concerted exploration of the area that was between the St.Paul and the Beroea gates (or beyond) which seemed to be the area of the Agrippan settlement. We would question the Plethron comment however as this was not in the "eastern" portion of the city but in the very centre, in proximity to the Forum of Valens. The Jewish community was not a ghetto in Antioch and thus just because Asabinus' house was subject to an ancient form of eminent domain it does not mean that he actually lived in the Jewish district. Once again none of the areas mentioned here as likely locations for the Jewish quarters have been excavated with any thoroughness so the evidence still remains buried. The Vicus Agrippae would not be difficult to tackle and the Daphne area needs a lot a more work. The Kerateion, alas, lies under modern Antakya, and tantalisingly out of reach. Again we have stumbled upon an obscure Italian language work that (maybe) fills in some unresolved issues and yet languishes in obscurity because it is in Italian. Back in 1952, Guiseppe Spano wrote his piece Il "Ninfeo del Proscenio" del teatro di Antiochia su l'Oronte for the Rendiconti of the Accademia Lincei. Spano at the time was a veteran archaeologist having been the Royal Inspector of Pompeii decades before and was a luminary in Italian archaeology. He had a history of writing on theatres and triumphal arches. One of his other works, Il teatro delle fontane in Pompei also dealt with what he felt was a nexus between water features and theatres. So much for googling someone to find an author because he is very hard to get information on. This major essay of his is only cited in a couple of other texts and finding the actual edition of the Rendiconti was a truly Sisyphean task, even at the New York Public Library (mainly due to the proliferation of nearly the same titles and the confusing volume and series numbers that Lincei used). It involved no less than six visits, several failed deliveries and much frustration. Rather than "published and be damned" its "publish and be forgotten" if Italian is your language of choice! Was it worth it? Well, Spano picked himself an obscure subject indeed, even by Antiochene standards. We all make bricks without straw in this field as there is so little to go on. He chose as his topic the nature of the nymphaeum which is sometimes referred to in the ancient texts. He goes for a rather holistic solution and not only bundles the nymphaeum into the theatre (which I dealt with elsewhere), but also combines in the Shrine of Tyche and its numismatic evidence trail. Interestingly he mixes into the subject the theme of the Septizodium in Rome, which I myself had mixed into discussing the Lesser Nymphaeum. His main thesis is that the nymphaeum was combined with the scaenae frons of the theatre. Moreover the water feature included a central section with the Tyche shrine embedded in it and then there were elements of the seven divine bodies also in the sculptural arrangements. He even goes so far as to say that Eutychides' famous statue had the boyish Orontes figure rising literally out of the waters of the nymphaeum. An interesting piece of artistic sleight of hand. It is true that the ancient texts mentioning the reconstructions of the theatre talk of a statue of Tyche being positioned upon the theatre in Trajan's rebuilding of the structure. However does one need to resite the famous statue into a niche at the theatre to link the two occurrences. I have long been under the impression that the shrine of Tyche was down near the riverbank of the Orontes. 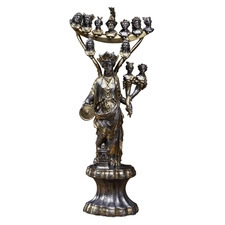 To me the images on the coins that show the shrine make it look like a standalone baldachin-type structure, not a broken-pedimented fountain excerpt. While the city had other important deities, Tyche was almost Antioch's own daughter and to think that the famous statue would have been hauled up the hill to become a water feature is a tad far-fetched. Definitely a demotion in godly status if you ask me. Why should one need to draw this conclusion? Rome had various statues of Apollo and Jupiter, as did every other major city. Why shouldn't Antioch have had several Tyche's adorning its streets and fountains? I do not doubt that the theatre had an image of Tyche but I doubt that it was Eutychides' statue and there is no reason to presume she should have been positioned in the fountain when it was always sounded like she had a shrine at the top of the cavea. The essay includes some images from the theatre at Aspendos. This is the best preserved theatre in the Roman world and is truly stunning. One of the images of the Nymphaeum at Aspendos (separate from the theatre) caused me to do a double take, because this plan of the nymphaeum looked very similar to the plan we included of the Lesser Nymphaeum excavated by Lassus with its array of rectangular and semi-circular niches for statues. This had prompted us to our Septizodium comment. Spano goes on to make a good case for Tyche being linked to the heavenly bodies and uses the statuette below from the British Museum as a key example of this pairing. He also discusses an image from the Megalopsychia mosaic that shows what he believes might be a naumachia even though it only has a rowing boat in it. He also discusses at length the "theatron" discovered at Daphne which others have mused upon as being some sort of ornamental reservoir/water feature, though he feels this might be the structure from the mosaic image. The essay is well worth reading for the various novel points of view it makes. The idea of a nymphaeum on the outside wall of the scena frons makes lots of sense. Uggeri's map almost gives this "feature wall" the opportunity, via his positioning of it at right angles to one of the east-west throughfares to provide a Haussmanesque vista up one of the street/avenues rising towards the theatre. Alas the theatre is no more. The small relics that survived above ground have been "improved" out of existence by Antakya's modernizers though it is pretty well known where it was and some demolition and excavation could bring a lot more of the structure to light and answer some of the issues that Spano raises. That Antioch was liberally furnished with bathing establishments has long been a given. Libanius rhapsodizes over these establishments and their multiplicity. We detail some of the known information in a specific posting on the whole theme. This note then is dedicated to the largest find by the excavators of the 1930s and one of these least reported. Bath F, which is suspected by some of being the historically cited Baths of Tiberius, was the most significant bathing complex found. Its mosaic (the Tethys mosaic) has received some coverage by art historians but the whole complex is scarcely mentioned by anyone except Hugh Kennedy in his piece on Antioch between the Romans and the Crusaders. He draws on some of the comments that were made by the excavators in their write up of the 1930s Princeton-led expedition. I have recently come to spend some time with the second and third volumes of the Excavation reports. I would note that the first volume, written in the first flush of enthusiasm, had clear chapters for each major find (the tower on the Island, the Hippodrome, the baths on the Island). By the second and third volumes in the late 1930s the focus had switched to mosaicophilia and Bath F doesn't even merit its own chapter but rather is buried within a catch-all chapter on the boring stuff like buildings, even though it had the Tethys mosaic that set the hearts of museum directors racing in the drawing of straws to see who got to keep it for their collection. However, Bath F is not like the plethora (five at latest count) of bathing establishments found on the Island. This is the only bath that was found on the "mainland" part of the city. And what a bath it was! The site stretched between the Colonnaded Street and the bend in the channel of the Orontes that separated the Island from the city proper. This meant that the complex was over 100 metres in length and covered a whole city block, which as we noted elsewhere were substantial in size. While not to be mentioned in the same breath as the Baths of Diocletian and Caracalla in Rome, these were nevertheless substantial and could be compared to excavated remains like the Hadrianic Baths at Leptis Magna. The attribution of the baths to Tiberius is rather touchy-feely. There was no evidence at the baths to justify this. The only inscription uncovered related to the rededication of the complex in the 530s AD. The baths were initally substantial as we have noted. They were destroyed to a large extent in the earthquakes of the 520s. The were rebuilt in a scaled-down, and frankly mediocre fashion, as part of the efforts of Justinian, a feat that Malalas sings the praises of but of which we are skeptical. They were then destroyed again in 540 AD when Chosroes burnt down the city and were never rebuilt. Excavations by the team did not extend to the whole site of the baths and this is an obvious target for future exploration as it is only a few metres below the surface and is still in one of the unbuilt parts of the walled city. What they did uncover was impressive enough. "Running south from a heavy masonry wall that had suffered severely from the activities of stone plunderers was a large three-aisled structure which had apparently had a wooden roof, possibly formining a clerestory over the central part. Traces of the burned roof beams were clearly to be seen on the floor. The central aisle, some 12.40 m. wide, was floored with a mosaic pavement of floral carpet design surrounded by a geometric border. In the center was a medallion with an inscription stating that the monument was a bath and giving a date (AD 537/8) for the floor. At the north end the border is returned around the foundations of what appear to be two large half columns engaged against the north wall, The other limit of the room extends almost to the south end of a large pool.... The side aisles were floored in opus sectile of light and dark marble laid in simple geometric patterns. Each aisle is two panels wide and the designs are alternated in checkerboard fashion except for two instances in the west aisle.... Separating the nave and the side aisle s were arcades, resting on columns, many fragments of which have been recovered. The capitals include several with the abacus inscribed, apparently with an inscription that ran from one capital to the next. Several of the arcade voussoirs were found. The stylobate between the columns was paved with marble slabs....."
They finished their efforts by digging a trial trench to the Colonnaded Street to satisfy their theory that the complex went as far as the main thoroughfare. Opportunely their initial diggings focused on a area with turned out to be a sizable pool (whether hot,cold or tepid is not mentioned). This pool had originally been rectangular but subsequent "improvement" had made it octagonal and resulted in the overlaying of the original pool bottom with the Tethys mosaic. 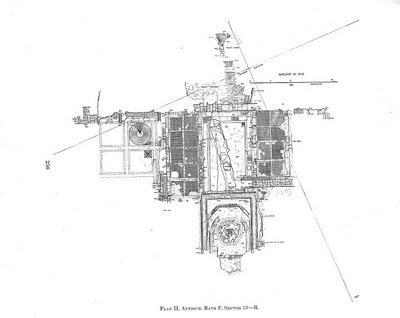 The plan below (click to enlarge) shows the remains of the main room as uncovered by the Princeton team. The baths were sizable to have such an enormous room within them. Baths were generally a complex with the full range of different temperature rooms and ancillary facilities like libraries and changing rooms and sometimes gardens and exercise facilities. This excavation (pictured above) zeroed in on only one part of the structure. It can be noted from the size of the figure in the photo that the floor level was between 2 and 3 metres below the current surface level. Clearly the potential exists to re-excavate what the team found (it was all filled in again after the work) and expand the scope to cover the whole block and get a perspective of the whole complex. The plan unfortunately does not include the trench to the Colonnaded Street (which would be to the right) and the text neither signals how far the main room was from the Street in question nor what was found in the trenching exercise (e.g. other rooms, colonnades etc). 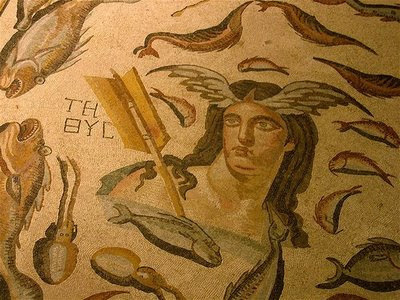 In what may be the unkindest cut of all, the Tethys mosaic (the central section of which is shown above) was lifted and sent to the Fogg Museum in 1939. It proved too large for the space and was sent to Dumbarton Oaks in Washington, DC where it ended up in an outdoor pool. Finally (and maybe not finally..) it was displaced by building activity at Dumbarton Oaks and migrated back to Boston where it was bought (and installed) by the Harvard Business School in 1990. It now lies in the Central Court of the Morgan Hall and serves as eye-candy for plutocrats in training. Finally we might touch upon the water supply for this bath complex. Obviously if it covered most of a city block it was an enormous facility. Water to feed the demands of the baths must either have come from the Spring of Olympias or from one of the aqueducts that skirted the mountain. If the latter then we suspect that the supply must have come on a high-level branch from the main aqueduct and would have had to vault over the Colonnaded Street. As we noted in our comments on the baths of the city, an issue to consider relates to the water supply to the Island. As we have seen there were a plethora of baths there. How did they get water? The three options are ground water, river water or a connection to the city's aqueduct system, which would have necessitated a branch of the aqueduct to run out a right angles from the main aqueduct and cross the branch of the Orontes. Aqueduct water would have provided pressure (for fountains etc.) whereas the other two means would not. Gregoire Poccardi in his essay "L'eau domestiquee et l'eau sauvage" comments: "Le reseau d'approvisionnemente en eau de l'ile est beaucoup plus difficile a apprehender que celui de la Veille Ville. On pourrait imaginer une connexion avec le systeme d'aqueducts situe sur les flancs du Staurin, mais aucune trace de liaison n'a ete reperee. Cette connexion est techniquement possible en raison de la topographie, car ces aqueducts surplombait egalement l'ile." D.N. Wilber in the second volume of the reports of the Princeton excavations notes: "There is no additional mention in the literary sources of other aqueducts except the ones from Daphne. However, just across the Orontes from the city and a short distance form the northern edge of the ancient island are some ruins which seem to be the debris of a number of aqueduct piers. In the excavations on the island five baths have already been uncovered and it is quite likely that the entire output of an aqueduct could have been used to in the baths and in the royal palace on the island. 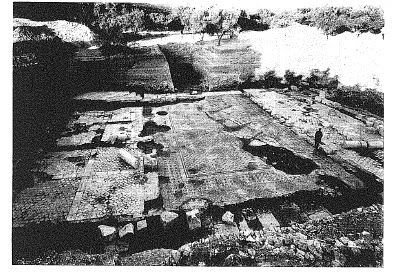 The location of these ruins indicate that such an aqueduct would have led from springs in the Amanus mountains, from a distance of at least ten kilometres and have been carried on a series of high level arches since the ground between Antioch and the foothills is so flat that a proper rate of descent in the channels could not have been obtained merely by following the ground contours".